Crown Lengthening is a surgical procedure in which a certain amount of gum tissue or bone (or both) is removed in order to expose more of the tooth to allow better support of a filling or a crown. Whether due to a breakage of the tooth at or too close to the gum line or because a crown or filling falls out of a tooth in which there is decay. 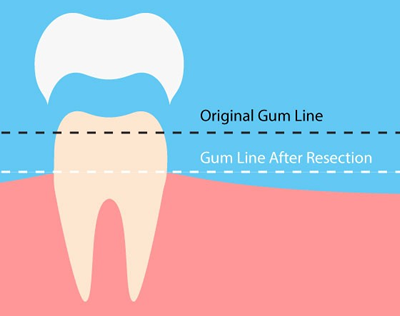 Crown lengthening is also performed in occasions where a person has excess gum tissue around the upper teeth which dentists something refer to as “gummy smile”. Crown lengthening is done when a tooth needs to be fixed. Sometimes, not enough of the tooth sticks out above the gum to support a filling or crown. This can happen when a tooth breaks off at the gum line. It also can happen when a crown or filling falls out of a tooth and there is decay underneath. To place a filling or crown, your dentist needs to expose more of the tooth. This is done by removing some gum tissue or bone. Some people have a lot of gum tissue around their upper teeth. Dentists call this “gummy smile.” This also can be treated with crown lengthening.